You'll cycle on several scenic highways and through state parks along this ride. The length of this bike ride and several steep climbs makes it better for advanced cyclists. The average cyclist rides at about 15 miles per hour, putting them in about 5 hours to do 75 miles. Roads can be icy and slick during the winter months. This bike ride is better in spring, summer and fall. This challenging ride offers steep climbs and unparalleled views of Lake Tahoe. There are two prominent hills on this route—800 feet up to an Emerald Bay overlook and a 1,000 foot gain at Spooner Junction. Several rolling hills throughout the ride bring the total elevation gain up to 4,024 vertical feet. This 72-mile ride is not for beginners; budget at least 5 hours to make your way around the lake. Start your ride early in the morning to avoid the heavy traffic from commuters and tourists alike. You can begin your journey from any point around the lake, but starting counterclockwise from South Lake Tahoe is a popular way to tackle this challenge. Put the lake on your right hand side and head west along Highway 50. 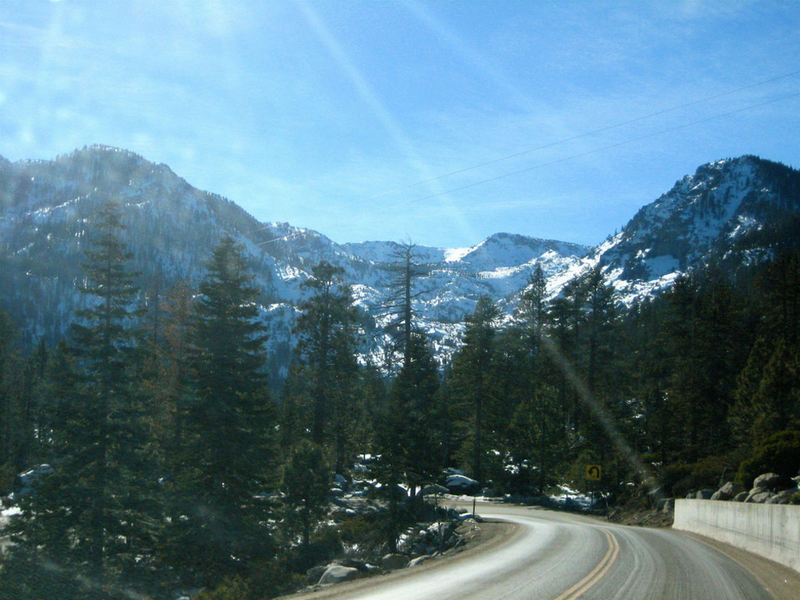 At the junction of Highway 50 and 89 in the small town of Meyers, continue right towards Emerald Bay on 89. There is a bike trail that runs parallel to the road, but unfortunately it only lasts for about 3 miles. There is a steep downhill followed by a rigorous uphill climb at the stunning Emerald Bay. Your next vista point is the equally beautiful D.L. Bliss State Park. From the west side of the lake continue on through the more residential north Tahoe towns. Take Highway 28 from Tahoe City to Sand Harbor State Park after crossing into Nevada. This is a popular campground area where you can stop for water during busier months. It is also the sight of the most rigorous climb along the ride. A steady nine miles of uphill will take you to the top of Spooner summit. From there, there are a few rolling hills and stunning vistas, but you will descend back to lake level as you head back onto the South Lake stretch after connecting once more with Highway 50. This is a must do for well-conditioned cyclists looking to get a longer ride at a high elevation. Cyclist will start the route at 6,300 feet above sea level and top out at 7,100, making this a feat not for the faint of heart or those who are out of shape. That being said, this is an epic ride thanks to the clean mountain air and the unmatched views of the entire lake. Don’t forget to soak in the scenery as you are huffing and puffing up those hills. Start you ride to the west of the hustle and bustle of Heavenly and other South Lake Tahoe shops and casinos. El Dorado beach right of Highway 50 and next to the water is a great place to leave your car for the duration of your ride. Other residential areas and beach access parks all along the lake usually have parking lots if you choose to start in another location.